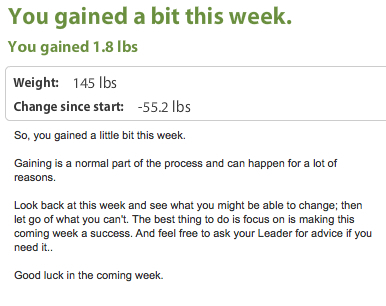 After seeing a large gain on the scale for the second week in a row, it is time to get down to business and get back on track. 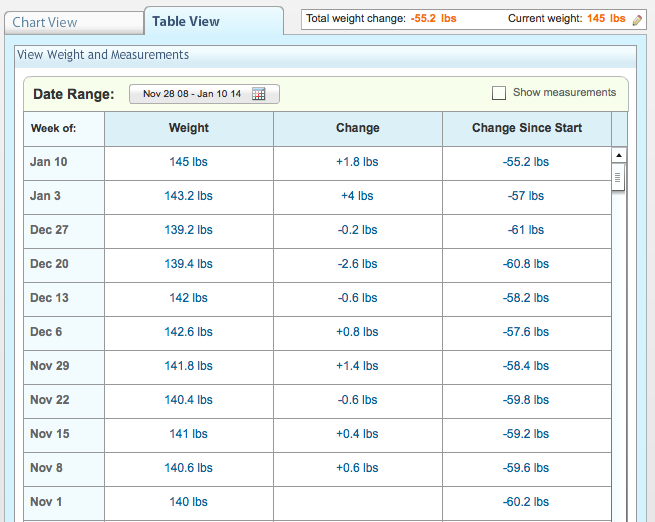 I had been doing so well…maintaining a pretty steady weight. 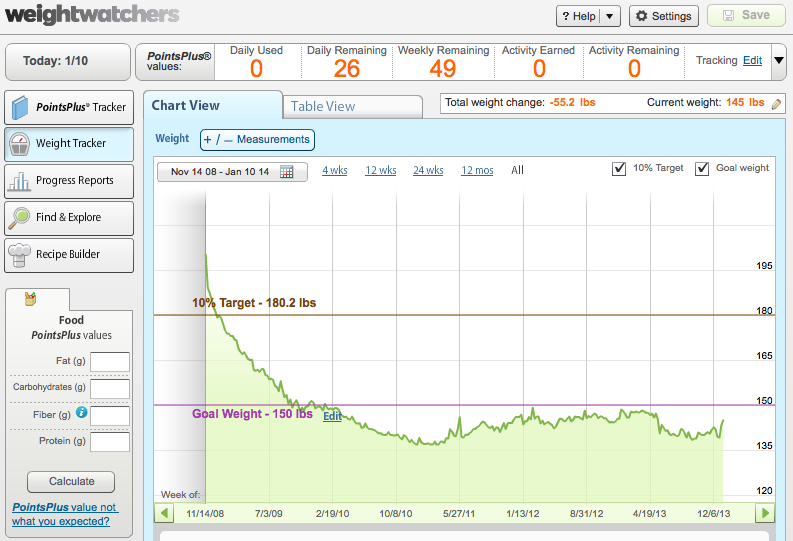 Here’s a look my weight chart since November 1 and also my entire weight graph from when I started. You can definitely tell I have had my ups and downs! So, this morning, my mind is made up. I have a new attitude and a new mindset and it is GAME ON! Plus, I have my first half-marathon of the year to prepare for. Training needs to start TODAY. No exceptions. No more excuses. No more nothing. The half-marathon is set for May 10 and that is exactly four months away. So, yes, it is time to get back to business. In the saga of my dad and the nursing home, I will tell you that although I was not particularly happy with his stay at Knute Nelson, after my last blog post, I was contacted by an upper management person and we spoke frankly about my dad’s care. AND…I will say that although there were still some minor issues, the rest of his stay was better. Okay, it was MUCH better. He was happy, my mom was happy and for the most part, I was happy. He’s my dad, I only want the VERY BEST care for him. And yes, my expectations are high. Too high? Maybe to some, but not to me. As of Thursday, January 9, he is no longer at Knute Nelson. HE IS HOME! For now. 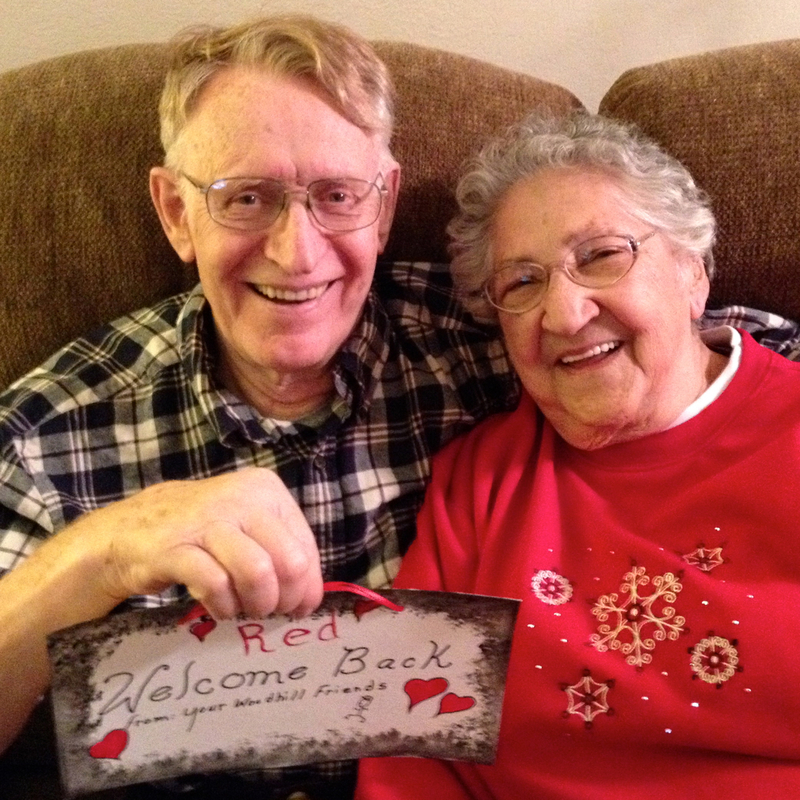 My mom and dad’s neighbors made the sign that my dad is holding and had it hanging on my mom and dad’s door when they got back home of Thursday. I took the photo late Thursday evening and both my mom and dad had had a VERY long day, so they were just a wee bit tired. But you can’t tell, can you?!?! My dad saw the foot surgeon on Thursday and as it stands right now, the doctor wants my dad to continue wearing his compression sock and his brace and to just see how it goes. With all the infection out of his foot, he may not have anymore pain or flair ups. And if he doesn’t, he may not have surgery after all. HOWEVER, if his foot, which has a ruptured tendon, starts to aggravate him or is painful at all, my mom is to call the surgeon right away and the surgery will be scheduled immediately. So, I guess, we now play the waiting game. If he does end up with surgery, he will eventually go back to the nursing home. If that happens, my dad said he chooses to go back to Knute Nelson. I may not be 100 percent okay with that decision, but it is what he is choosing. He said he was comfortable there and that he knows that staff and they know him. He said, “Why change?” I guess I can’t argue with that. I know one things for sure, he LOVES the French toast there! So……my shoulder issue is still NOT resolved. I have had a total of three MRI’s and at least six X-rays. I have seen my regular doctor and an orthopedic doctor. I do have a small tear and a small cyst and some bursitis. However, the ortho doc believes that I have something going on in my neck and has now referred me to a neck and spine specialist. The ortho doc, after looking at the results of the neck MRI, said there are some issues there and that this is probably what is causing the pain down my shoulder and arm, along with the tingling and numbing. So, I now sit and wait for a phone call from the neck and spine specialist to set up an appointment. I. Can’t. Wait. In case that didn’t work, I meant to say, you can find me on Instagram. Getting back to training is what I always do too when I gain back a few pounds! Next Next post: A harsh and much needed conversation with…myself!